BizCompare.com Provides Free Lead Generation Tool for Sales Reps and Sales Managers. BizCompare.com publishes detailed company profiles of 1.5 million companies in the U.S. in the business services vertical. The site features a lead generation tool so sales managers or sales reps can quickly narrow a group of companies into more qualified sales leads. The lead generation tool provides one-click filters to taper a potential audience of prospects by geography, size of business and how long they’ve been around. The specific filters are by State, annual business sales, number for employees, sales per employee and years in business. The final outcome is detailed business profiles that only match the desired criteria. See a sample BizCompare company profile. “Most companies have a sense of what their current customers look like such as how big they are, where they are located and their age” says Geoff Vincent, CEO of BizCompare.com. The challenge is how to narrow a large pool of sales leads to those with the best odds of becoming long term customers. “The filtering tool on our site enables sales managers to take their specific knowledge of their best customers and apply those attributes to find the most highly qualified prospects.” The tool is intuitive and fast. In minutes, a user can look at dozens of combinations of attributes and quickly distribute leads to their sales force. The tool is also useful for sales planning tasks such as territory alignment. See an example companies listing page for Building Inspectors with filtering tools. The site also has 108 detailed industry reports, one for each of the business service sectors covered. “Who hasn’t received a cold call from a sales rep who knows nothing about your industry. It’s an immediate turn off and virtually dooms the call” says, Mr. Vincent. 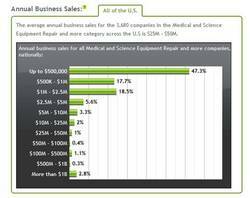 An industry report helps prepare a sales rep for a call by providing a foundation of information including industry description, top 20 services provided by that industry, graphs on sales, employees, sales per employee & years in business plus the number of companies nationally or by state. See an example industry report for Building Inspectors. Information provided for the 1.5 million companies: Company name, address, phone number, website, contact name and title, services/specialties/brand names associated with the company, NAICS and SIC codes, Annual Business Sales, Number of Employees, Sales per Employee and Years in Business. Not all data elements are available on all companies. The BizCompare.com site is owned and managed by BizCompare Inc. which was founded in 2010 and is based in Mississauga, Ontario, just west of Toronto. The BizCompare.com site consists of profiles of 1.5 million U.S. businesses who are primarily involved in the business services sector. Site users are looking for information on various business services industries and the companies that may provide these services. Key features of the site include peer group comparative information presented in text and graphs. For more information go to http://www.bizcompare.com or call 647-220-2515.